Vidyarambam was founded by Mr. Ranganathan, a resident of Tamil Nadu, India, in 2002, to provide supplemental Math and English classes to rural children in Tamil medium schools. He started a learning center for 17 students in rural Tamil Nadu, and that one center has now grown to 4800 study centers in 4000 villages. 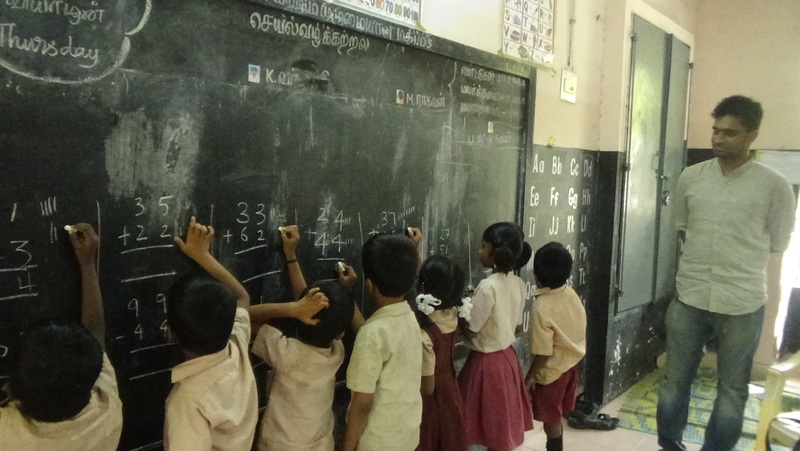 Vidyarambam have developed a unique phoneme-based English education method, and an activity-based Math education method.They train teachers in their methods and pay the teachers to run classes in existing Government Tamil medium schools, in partnership with the administration of the schools. Since government school teachers aren't necessarily in touch with the latest pedagogical methods, and the school administrators are given stringent educational achievement targets to meet without necessarily having the tools and resources necessary to achieve these targets, they welcome collaboration in their educational efforts. The partnership with Vidyarambam is a win-win situation for the school teachers and children, as evidenced by the glowing testimonials from the Headmistress, Chennai Primary School, Mullai Nagar, and the Headmistress, Chennai Primary School, Ekkattuthangal. OPEN board members met with Mr. Ranganathan at one of the OPEN fund-raising events in Northern Virginia in 2013, and were impressed with Vidyarambam's achievements and high ambitions. OPEN funds the operation of Vidyarambam's Easy Learning English classes, for grades 6-8, and Easy Learning Mathematics, for grades 1-5, in 10 Government Tamil medium schools in Chennai. These classes benefit 1700 students at a cost per student of $16 annually. The aim is to enable Tamil medium students to read and to write basic English, and to supplement their existing Maths teaching. 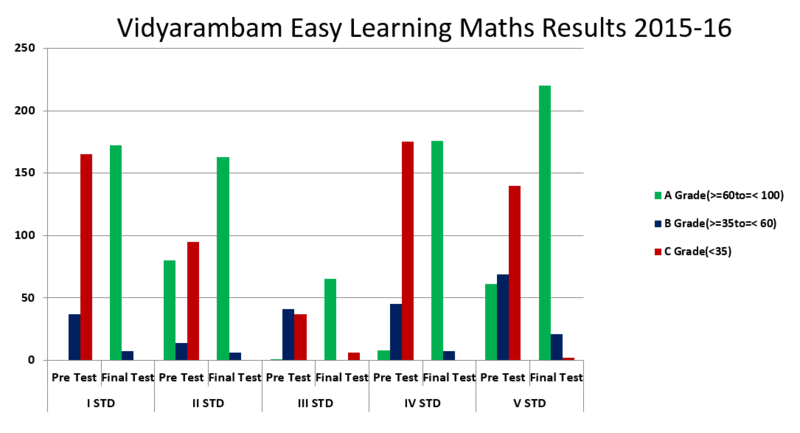 Vidyarambam measure the outcomes achieved by their methods rigorously. They typically run a diagnostic test at the start of the academic year; a mid-year test at the mid-point of the academic year; and a final test towards the end of the academic year, and collect statistics on the performance of the students at each of these points. 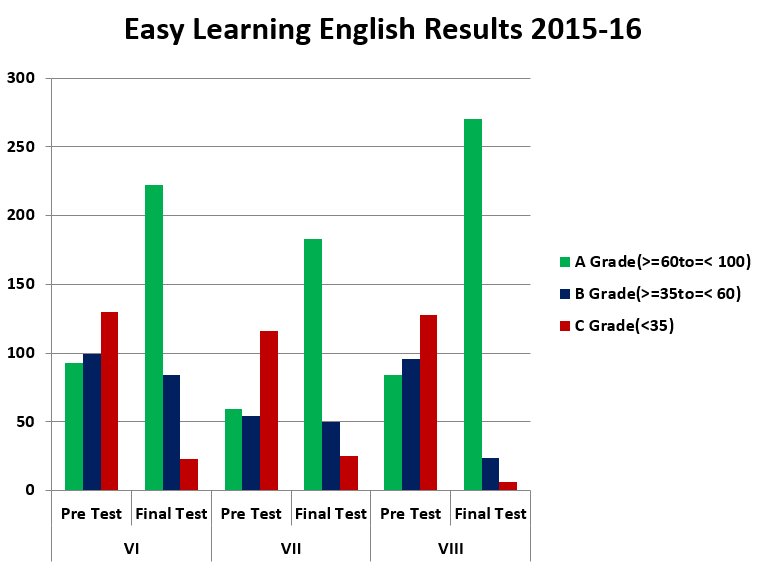 A typical comparison is shown below, and shows that the bulk of the students progressed from a C grade in the diagnostic to an A grade in the mid-year test. A typical class in action is shown in the video below and shows that the children are very engaged in class.